Running with SD Mom: #FeelAmazingEveryDay: Amazing Grass Protein Review, Discount Code & #GIVEAWAY! 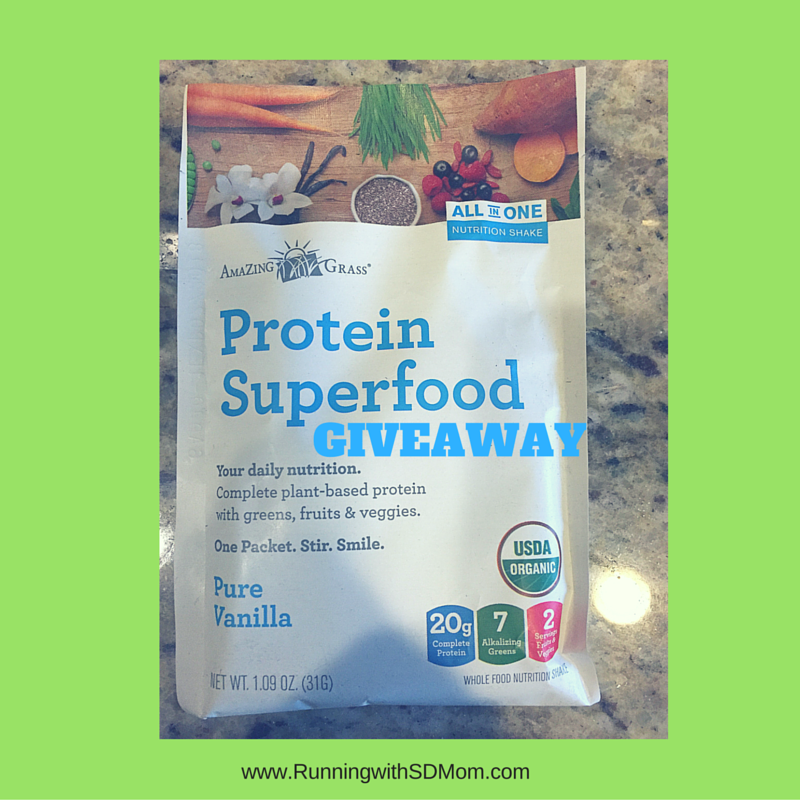 #FeelAmazingEveryDay: Amazing Grass Protein Review, Discount Code & #GIVEAWAY! Happy Tuesday Friends! As part of my Sweat Pink/Fit Approach Ambassadorship, I get to try some awesome products and tell you all about it! The newest one to come my way is the Amazing Grass Protein Superfood! Let's start with what it is all about. It has 20 grams of complete plant-based protein, 7 servings of alkalizing greens and 2 full servings of fruits and veggies. Each serving has 110 calories. With that, you get 190 mg of potassium and 20 grams of protein. And other vitamins too like Vitamins A, C, Iron and Calcium. Mix that with 30 calories of unsweetened almond milk, 1 medium RIPE banana (100 calories) and 1 package of Emergen-C for a palate pleasing smoothie for 250 calories! It keeps me full until lunch time! No easy feat for me, trust me! If you follow me on Instagram, you know I like to #RUNch! So I am usually running before I have had a chance to eat and this smoothie gives me plenty of energy to power through the workout! As part of a feel good (GLUTEN FREE!) breakfast, it has me energized for my morning! I have a discount code for you to use. Use code 40SWEATPINK2 for 40% off your online purchase! And stay in the know, help create new products, and receive coupons for Amazing Grass's newest products by signing up for the Amazing Grass community newsletter here! But how does it taste? AMAZING! (see what I did there?) It isn't gritty AT ALL! It is ground super fine so it blends perfectly! I can't speak to the original and chocolate peanut butter flavors but the Vanilla is on point! I look forward to my morning smoothie every day! So, I want to give one of you the opportunity to win your own Protein Superfood powder – winner’s choice of Original, Vanilla or Peanut Butter Chocolate. All you have to do is comment below with your favorite smoothie ingredient. No purchase necessary. Void where prohibited. 1 winner will be selected via Random.org. Open to Residents of the US only 18 years of age or older. Must have a non P.O. Box mailing address. Winner must have a valid email address (please make sure you leave your email address in the comments). Remember, all you have to do to win is comment below with your favorite smoothie ingredient and make sure I have your email address! I was sent product free to review but I was not compensated in any other way and all opinions are my own! I love adding Greek yogurt for thickness, creaminess and more protein! Have never tried smoothies but have been researching products and looking to start. Favorite smoothie ingredient? It's a toss up between kale and bananas. I can't have one without the other. I'm pretty excited to try this protein powder. I've always had a hard time finding a good one. I'm especially into smoothies for breakfast when it's so warm out. I'd like to win. I love to blend frozen bananas into my smoothies and also top them with chocolate chips! My favorite smoothie ingredient is spinach...a great way to get some greens! Chocolate protein and peanut butter! My favorite smoothie ingredient is avocado. It doesn't have a taste and provides a lot of nutrients! I always throw strawberries and bananas into my smoothies so I guess those would be my favorites! Thanks so much for the chance! My favorite ingredient in smoothies kale!! My son agrees. I love spinach and blueberries the best. Protein powder is my favorite ingredient because it masks the flavor of all spinach and kale!! Throwing in frozen blueberries for healthy antioxidants is my #1 favorite addition. I like adding frozen bananas and peaches for a creamy texture. Thanks! I love putting frozen fruit in mine! Love berries in my smoothies. My favorite smoothie ingredient would be frozen pineapples and coconut milk. My favorite smoothie ingredient is chia seeds. Kale and Spinach for green nutrients and energy in my Blendtec are my favorite ingredients! My favorite smoothie is strawberries,bananas,milk,ice,vanilla extract,yogurt. This chocolate & pb powder sounds great. My favorite smoothie ingredient is fresh strawberries. I always add either a banana or 1/4 avocado for smoothness. I love to add chia seeds and flax seeds with pb2 powder in my smoothies! Bananas are a must for me. My favorite smoothie ingredient is almond milk and strawberries!! I like to add orange juice to my smoothies. Citrus fruits are my thing. Frozen bananas are the one thing I always have in smoothies! My favorite smoothies ingredient is Almond Milk. I love blueberries in a smoothie. My fave smoothie ingredient is nut butter - especially cashew or almond butter! I like to add a scoop of flax meal to our smoothies. I love flax and chia seeds in my smoothies. Frozen seasonal fresh fruit is great in a smoothie. I always include frozen bananas. My favorite smoothie ingredient is strawberries and bananas. My favorite is peanut butter. My favorite smoothie ingredient is coconut and avocado! My favorite ingredient is yogurt in my smoothies. My favorite smoothie ingredient is bananas. My favorite smoothie ingredients are frozen fruits and spinach. I also add fresh fruit and yogurt to mine, it is soooooo tasty too! My favorite smoothie ingredient is frozen blueberries!